Us in tow with our cocoon, ready for a change. RV dreaming yet? It’s been three years since we’ve seen the Smoky Mountains and boy was she welcoming us back. The morning we arrive the peeks of mountains find themselves covered in eight inches of an unexpected spring snow. I could feel the change in the air as the mountains dipped in milk appear in our windshield and echoes of “Good ole’ Rocky Top” tickled my ear. The last time we had visited this area the direction of our lives was about to turn a big fat corner. It was April 2014 and we were celebrating our 24 year wedding anniversary. We had decided to check out Howard and Linda Payne’s week long educational seminar on how to live full-time and travel in an RV. 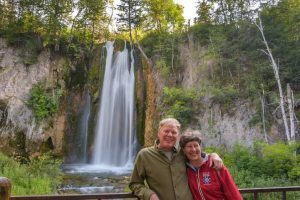 We had been following these two for a couple years and spent many hours combing through their RV-Dreams website and reading about their adventures. We were dreaming perhaps we could do something similar in maybe five years or so, but really had no clue if it was doable or how to do it, and truly felt like we had to be crazy just to think we would ever give up the home, farm and things we had built so we could live in a tin box with wheels. We had no clue that week that we would meet so many other like minded folks that were also feeling that same wind stir them to change their lives path, put on their “crazy” hat and do the totally unexpected thing. How neat to find that we weren’t the only ones with this longing to see America, climb a new mountain, chase a river, explore a National park, see an eagle in flight………. At the end of that week long educational whirlwind the tiny flicker inside us had grew into a huge fire and within the year we would give away and sell almost everything we owned, tuck only the prized and personal items into our little 19 ft. travel trailer, say goodbye to friends, quit our jobs and set out on the adventure of a lifetime. 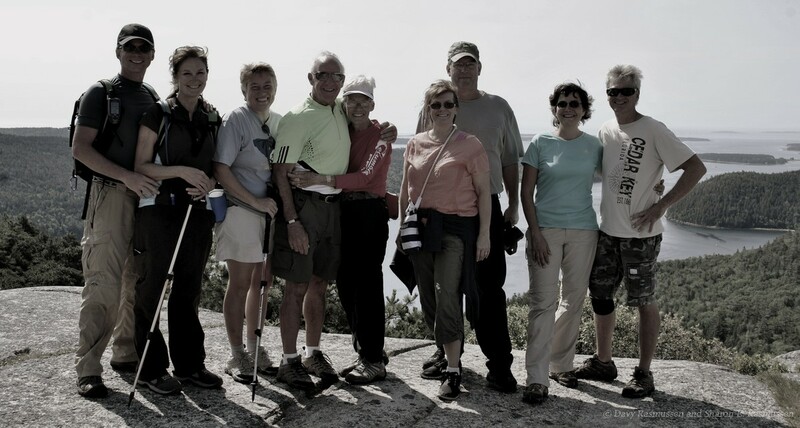 Hiking with friends in Maine. In 2015 we joined past rally attendees for the first RV Dreams Reunion Rally in North Carolina, which was for anyone that had attended one of their past fifteen educational rallies. Howard and Linda wanted this gathering to be all about fun and comradery. And boy was it ever. Instead of educational seminars, we socialized with other RV’ers whom had all benefited from an RV Dreams rally and Howard’s awesome educational blogs about life on the road in their fifth wheel. We spent time just story swapping, laughing and getting to know one another. There were day hikes into the mountains, kayak trips down the river, foodie tours, campfires, singalongs and so much more. We were able to really hang out and visit with other couples who had, like us, hit the road and were living the full-time traveling lifestyle. There were a group of us that just clicked. All different careers, educational backgrounds, family statuses and life stories. But a common thread that weaved through this hodgepodge group was that most of us were too young to retire. 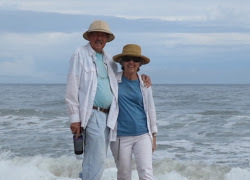 We needed to make a little money working from the road and we shared a deep yearning to do something different and adventurous before we reached retirement age when you never know if you’ll be physically able to do the things that we want to do now. During this rally friendships were born and some rekindled. By the end of this week long fun packed rally, we’d all share travel calendars and make plans to meet up with each other down the road. We even caravaned with a few other RV-dreams family members up the east coast into Maine that summer. So today we pull into River Plantation RV Resort in Sevierville to attend another RV Dreams educational rally. This time is a bit different than when we were here in our little 19 ft travel trailer. Our Happy Place, or “OhP” as we fondly call our home on wheels, is now a 36 ft fifth wheel. We quickly find our site and make ourselves at home. There is a pre-rally campfire at Howard and Linda’s campsite tonight and we don’t want to miss it. Before we even had our chairs set out in our outside living room, Howard stopped by to say hello. He may have been a bit overwhelmed with our big smiles, hugs and overall enthusiasm to be here. 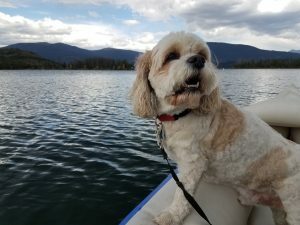 We’ve been traveling full-time since December 2014 and we feel somewhat confident that we know most of the ins and outs of RVing but there is always more to learn. Howard and Linda celebrated their 12th year living in their 5th wheel this month, so they have a lot more experience and knowledge to share. 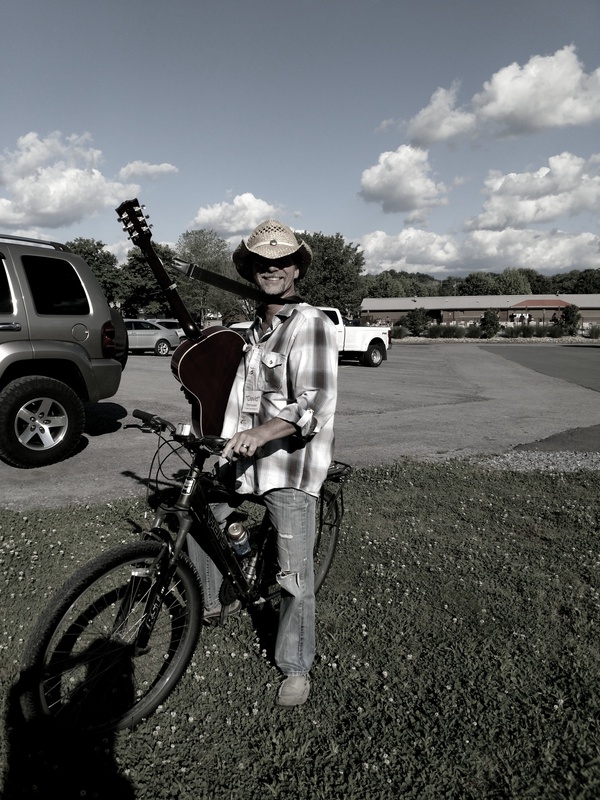 David riding his bike with his guitar to the Hillbilly hoedown. Mostly though, for us, this was about giving back. We wanted to be there for other couples that had that same anxiety that we felt at our first rally when we were just dipping our toes into unknown waters. We wanted to help answer questions and share the excitement of life on the road. There was also the need to be open and honest about the ups and downs of living full time in a camper on the road. We were pretty surprised at the amount of folks that attended the seminar but were staying in a cabin or nearby hotels. Some were on their very first trip in their RV and some were on their first week of full-timing. There were 5th wheels, 40 ft motor homes, pickup truck campers, vans, and tiny trailers. There were folks in their 30s through the 70s. Couples and singles and from all walks of life. Through the week we watched the fire spread. We learned a few things we had forgotten. We saw new friendships form. 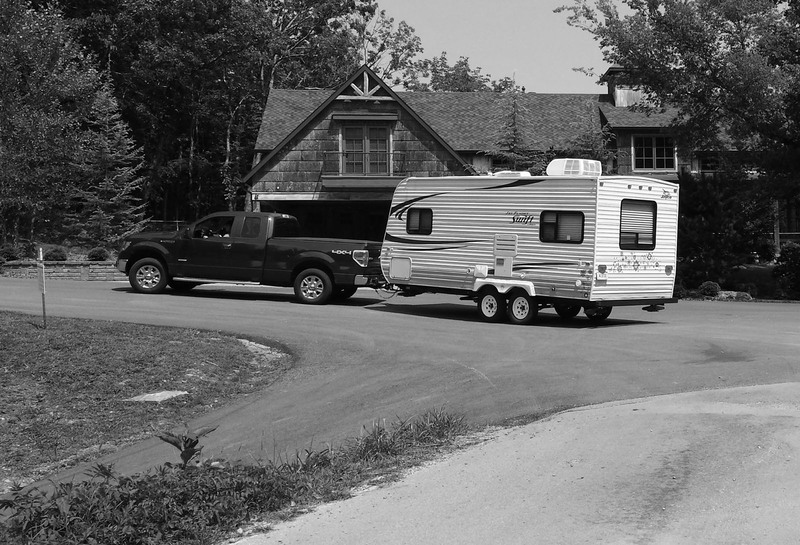 We listened to five year plans changing to “our house is going on the market as soon as we get home.” One thing we notice about all couples that are living this RV life, is that they are all in love and hold a deep respect for one another. I guess you have to. It’s imperative that you like the one you are stuck in a box with day in and day out. There are often pivot points in your life where you can look back and see the people that truly made a difference in your life. The ones who were a gentle wind that blew the right seeds your way. They may not even realize the importance of their actions but you know without them you wouldn’t be living the life you love. Some of these angels are our dear friends, Howard and Linda. Awesome post and nice reflection on the rally. It’s funny how much more special the rally has become as time passes. So lucky to be at that rally as it has shaped so many friendships and travel routes!! Now hurry up and get out west!! Yes, it is amazing how a little rally in the Tennessee hills brought together so many kindred spirits and bonded lasting friendships. We are on our way!!!! Thanks for the great read, miss and love you guys! Love you too! So glad that the 2014 rally brought us together. You have captured the feelings a lot of us share about Howard and Linda! Hope we can share another campfire – sooner vs later! Hugs and love to you both! Just reading this post makes us remember how life-changing our first RV-Dreams Rally had been. Howard and Linda are special people!!! I often wonder how many people they have helped realize there RV-Dream. Paying it forward seems to ring true in this community…RVers helping RVers…which in turn becomes Friends helping Friends:o))) What a WONDERFUL life!!! One of the big reasons why we love the lifestyle is the awesome community of friends that we’ve become apart of. It is a wonderful life indeed! Your prose is like stepping into a painting that just touches my heart…hoping that when you are in FL next time we can spend some time relaxing! Although right now we are not full timing, I see us getting back on the road for extended trips one day in the future. Thank you Ellen! I look forward to just relaxing with the two of you and catching up! 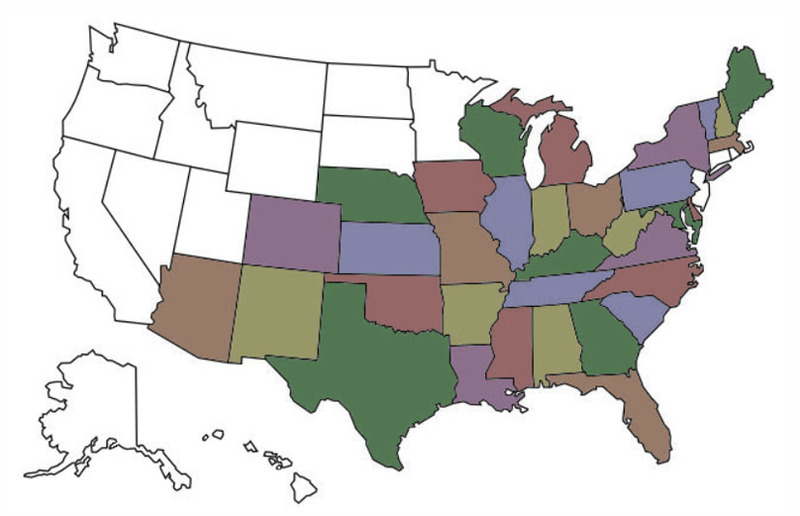 Let us know when you are traveling again and we’ll make sure our paths cross. Thanks Jim and Barb. We’ve heard rumors of a reunion rally out west next year. Wouldn’t that be awesome! Sure hope that our wagons can circle up and we can spend some time with the two of you around a campfire soon. A lot of us have Howard and Linda to thank for the courage and inspiration to take the big step into FT RV’ing. Without their commitment to education I am not sure we would have hit the road in ’14 as well. Great job paying it forward and reassuring some new dreamers that it can be done!